Nevermind this particular situation turned into a subversion. It still makes a badass illustration. A character does something incredibly brave and is killed, maimed, or otherwise irrevocably harmed doing it. A bad character who was once good can redeem himself in the last act by Taking the Bullet that was meant for The Hero, thus expunging all his previous evil, avoiding forcing The Hero to arrest or confront him, and avoiding any real life penalties like disgrace and jail. This is like Redemption Equals Death. In this case, the death and redemption come in a single act. The one at the beginning of the story, which sets the tone for the rest of the tale. The one in the middle of the story, wherein the Heroic Sacrifice leads to new heights of Badass, or new depths of depression, depending on the story. Sometimes both. The one at the end of the story which serves as a Grand Finale, an example of "This character is Too Cool to Live", or the kernel of a Downer Ending or Bittersweet Ending. The "Too Cool to Live" Heroic Sacrifice is the most common type in American movies. Often, The Hero Dies in a heroic sacrifice at the end. See Taking the Bullet, Self-Destructive Charge, You Shall Not Pass, Take Me Instead!, Someone Has to Die, Sealed Evil in a Duel, and Heroic Suicide for specific types of Heroic Sacrifice. Usually requires that a character be Not Afraid to Die. If the Heroic Sacrifice was pre-planned, it's a Self-Sacrifice Scheme. Often preceded with a Sneaky Departure from the team, or a More Hero Than Thou dispute. A Friend in Need often requires it. Contrast Villain's Dying Grace, when a dying villain decides to save a life. The Doomed Moral Victor fights a battle where the outcome is clear from the beginning. If the character has time to say some last words before dying, they often do so in an Obi-Wan Moment. Often a Dying Moment of Awesome. Compare and contrast Zero-Approval Gambit (where the hero sacrifices his good name instead of his life), My Death Is Just the Beginning, Senseless Sacrifice, Suicide Mission and Stupid Sacrifice. 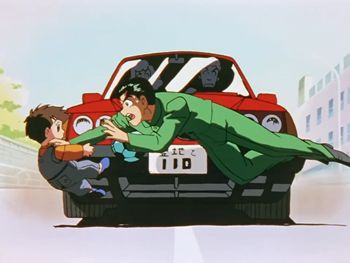 ↑ In a nod to Captain Tsubasa, the kid would've survived by bouncing on his soccer ball. This page was last edited on 16 July 2018, at 21:28.